Students need to know how to effectively communicate with one another and how to readbody language. Students need to be taught and understand the importance of using positive language when communicating with others. Students need to be able to address conflict in a positive way with opportunities to practice resolving conflict appropriately. 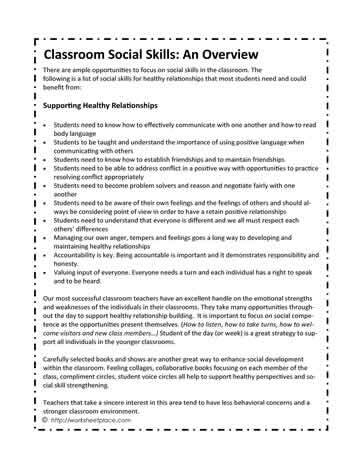 Students need to be aware of their own feelings and the feelings of others and should always be considering point of view in order to have a retain positive relationships. Accountability is key. Being accountable is important and it demonstrates responsibility and honesty. Valuing input of everyone. Everyone needs a turn and each individual has a right to speak and to be heard. Our most successful classroom teachers have an excellent handle on the emotional strengths and weaknesses of the individuals in their classrooms. They take many opportunities throughout the day to support healthy relationship building. It is important to focus on social competence as the opportunities present themselves. (How to listen, how to take turns, how to welcome visitors and new class members etc.) Student of the day (or week) is a great strategy to support all individuals in the younger classrooms. Carefully selected books and shows are another great way to enhance social development within the classroom. Feeling collages, collaborative books focusing on each member of the class, compliment circles, student voice circles all help to support healthy perspectives and social skill strengthening.